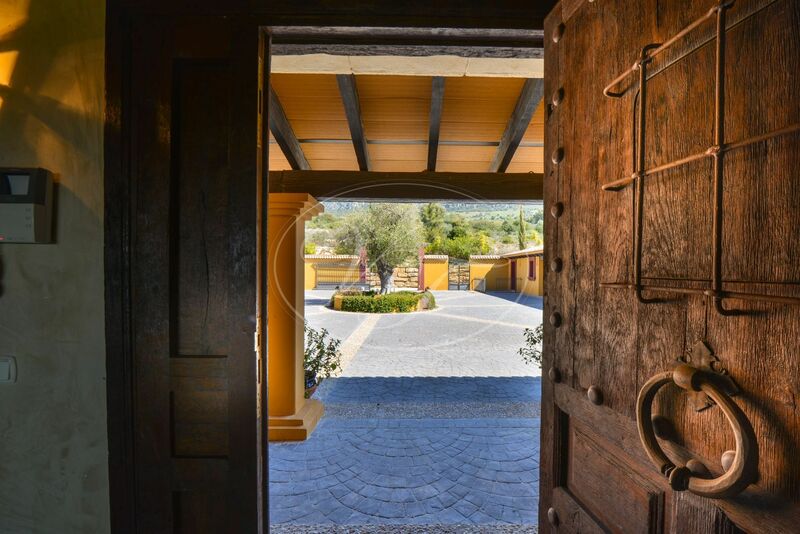 A unique luxury country villa, built in Cortijo style, with traditional courtyard, equestrian facilities and separate staff house for sale in Casares, near Marbella. 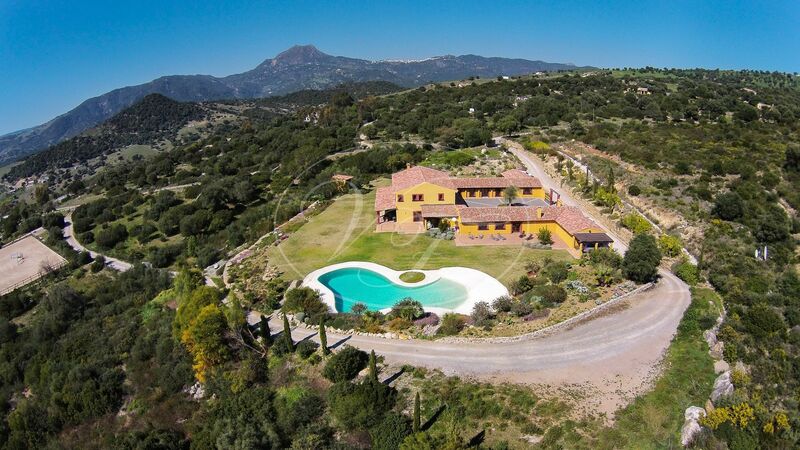 Located at just a 20-minute drive from Marbella and Sotogrande in Andalusia, Spain. 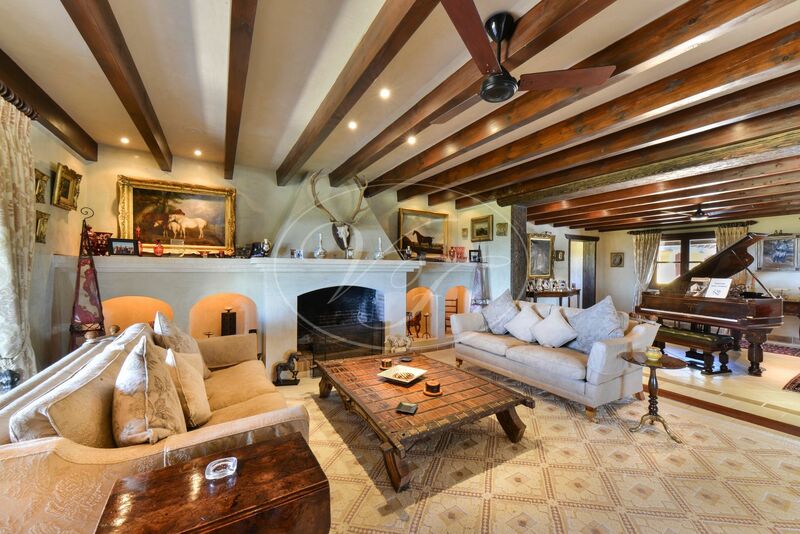 A truly spectacular estate on an extensive plot of land of 12ha, counting with an 871m2 main house, 209 m2 guest house, 100 m2 traditional courtyard styled stable facilities and a 25×62m outdoor sand arena. 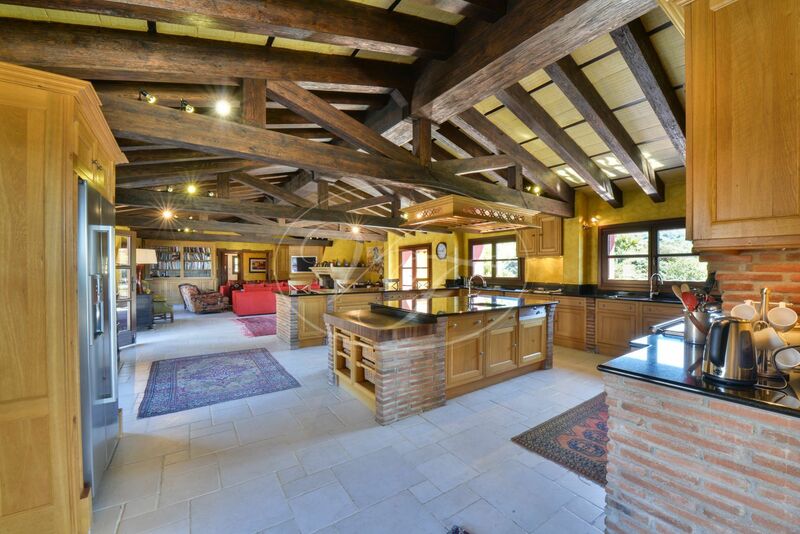 The property has been reformed in 2007 and is finished to the highest standards. 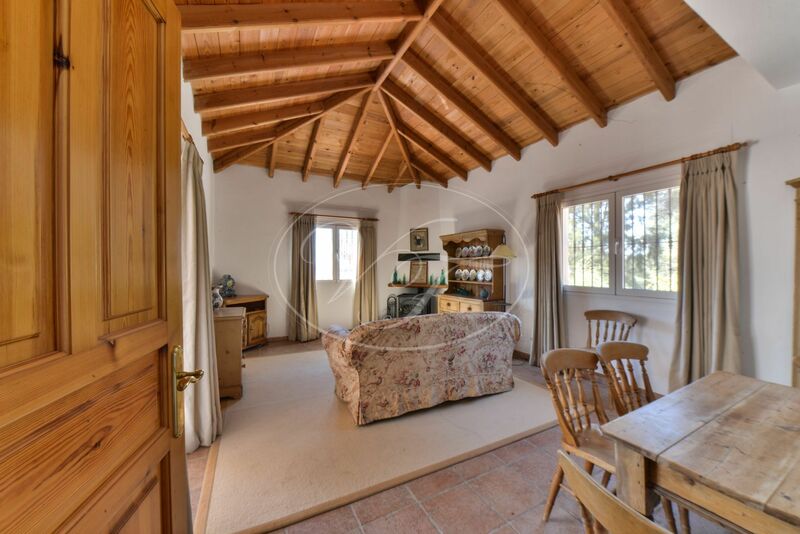 It is an absolute gem, a comfortable family home, where you can enjoy living in the countryside, yet have the coastal facilities within easy reach. 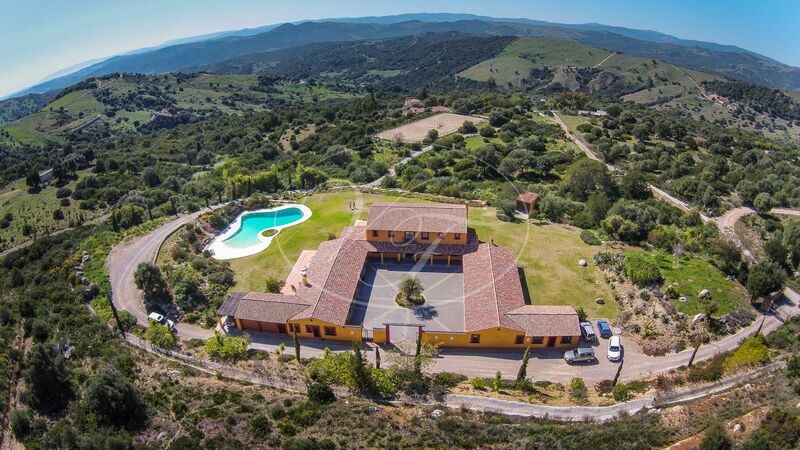 The estate offers a completely private location and has stunning views over the rolling hills towards Jimena and Gaucin. 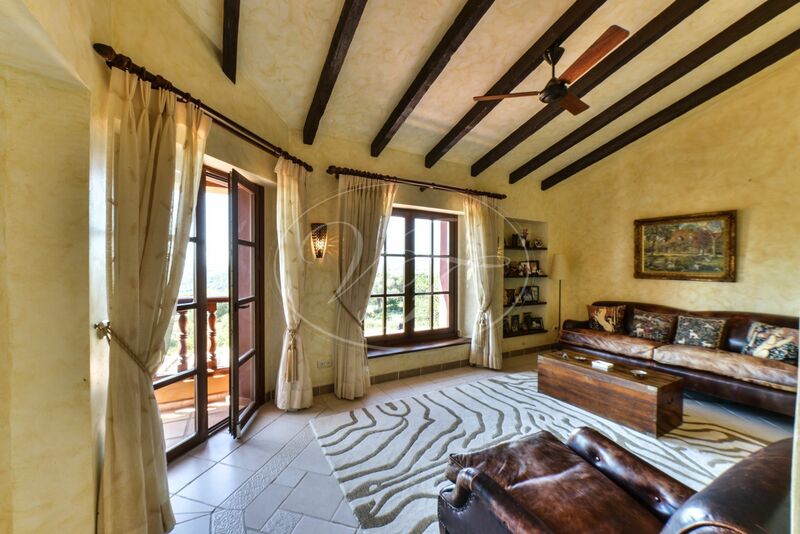 The main residence is accessed through an electric gate with a security system, leading to ample parking. 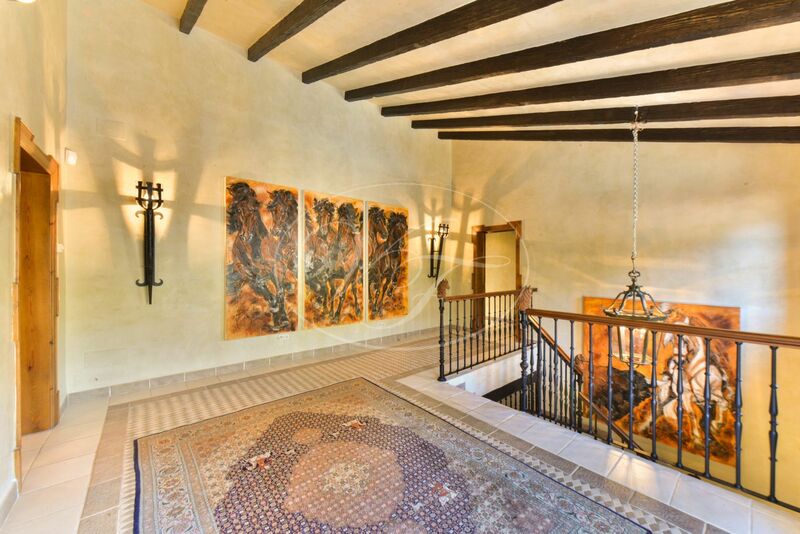 A large courtyard leads to the front door. 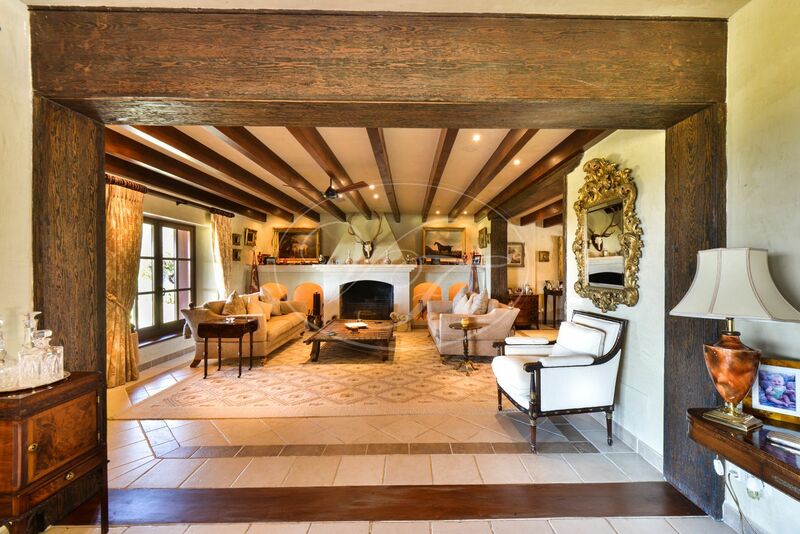 The ground floor consists of a spacious entrance hall with cloakroom, an open plan lounge with a large fireplace and a formal dining room that easily seats 8. 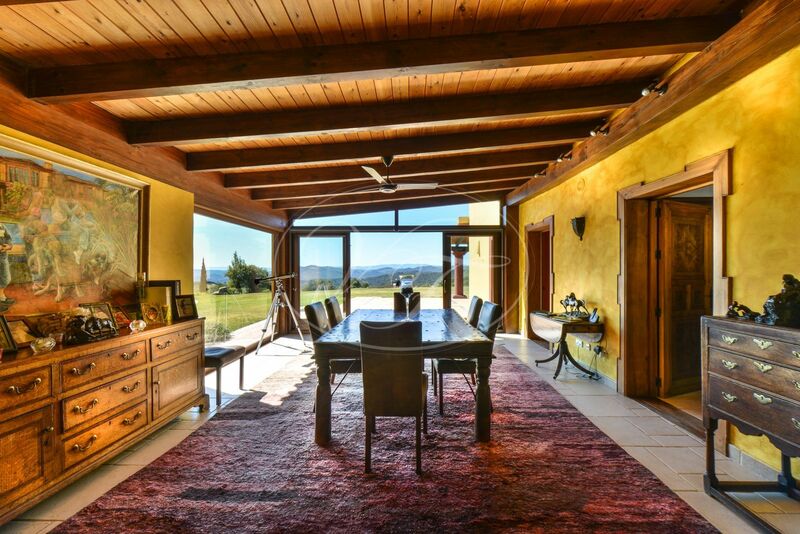 Both have access to an extensive covered terrace with stunning views over the garden and the rolling hills. 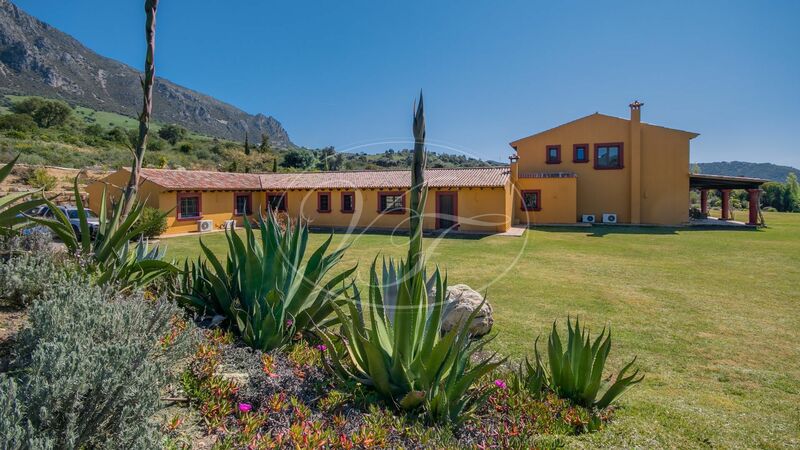 The left wing of the Cortijo contains a 130 m2 ranch style kitchen area in which you will find a fully equipped Clive Christian kitchen with 4 oven electric AGA, a spacious lounge/TV area, a separate breakfast room and next to that a laundry room, a pantry and a climate controlled wine cellar. The kitchen wing has it’s own entrance, either through the 2 car garage or directly from outside and comes with ample storage here for boots, coats and golf equipment. You will also find a cloakroom here and a study room which used to be the homework corner. The right wing is accessed through the hallway and contains two double bedrooms sharing a bathroom (with bath and shower) and a third double bedroom with a shower room en-suite. The bedrooms are finished with built-in wardrobes. The right-wing gives access to the machinery room as well. 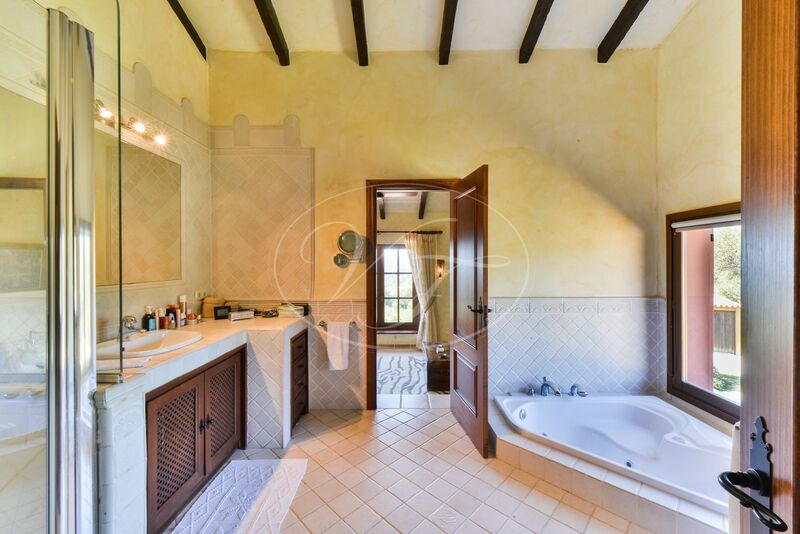 On the first floor, you will find two master suites, both with bathrooms and dressing rooms en-suite. 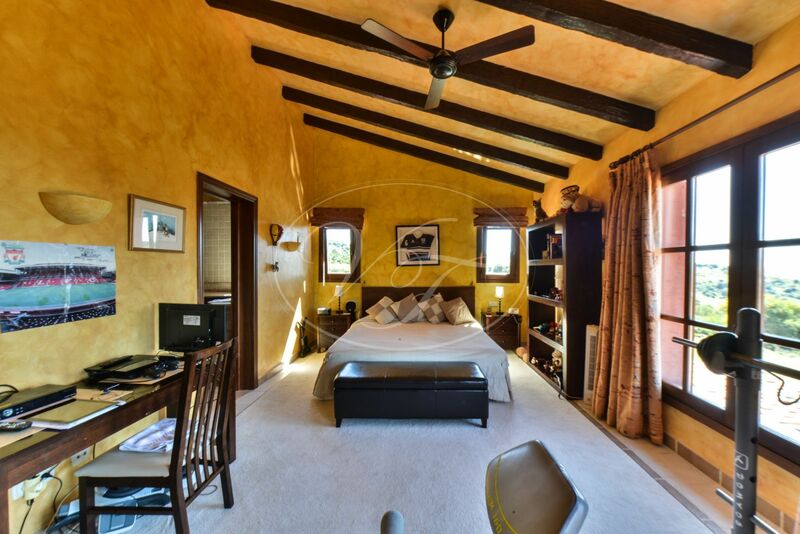 One of the master suites also comes with a lounge and has a private balcony. 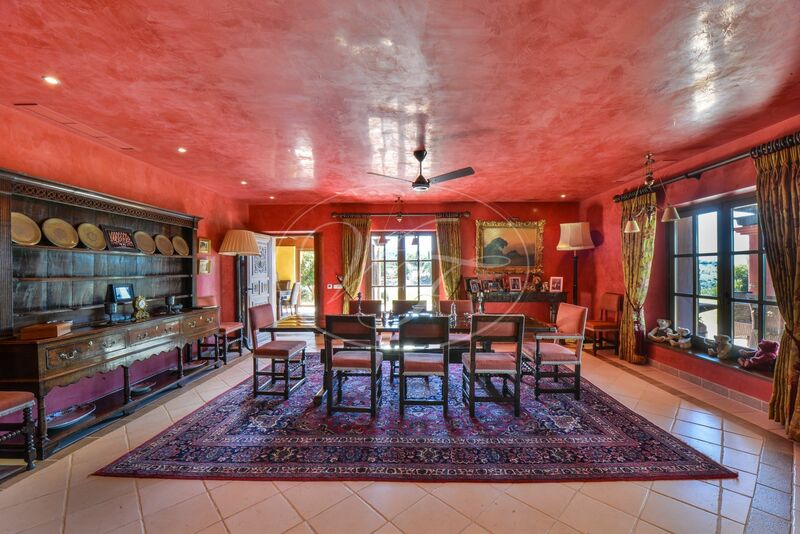 This comfortable family home comes with underfloor heating throughout (oil-fired), three bedrooms have A/C, two have ceiling fans. 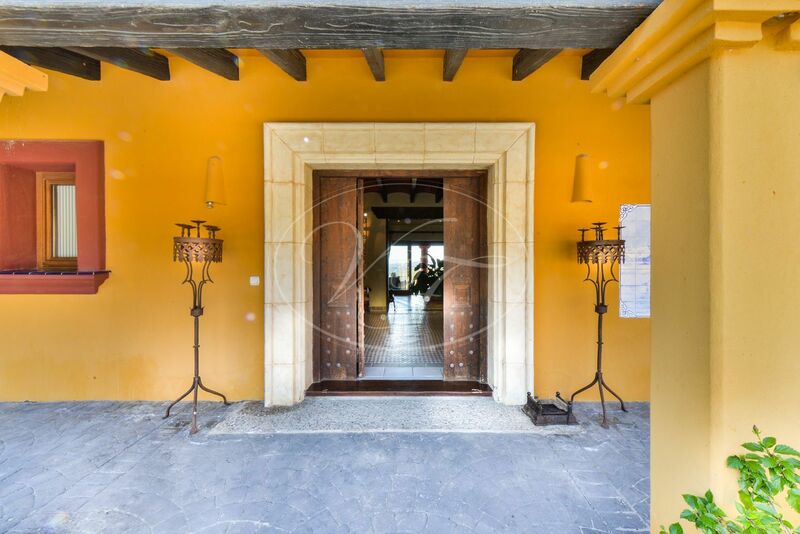 The house is finished with many beautiful details as rustic ceramic tiled floors, high beamed wooden ceilings and Ronda carved doors to mention some of them. 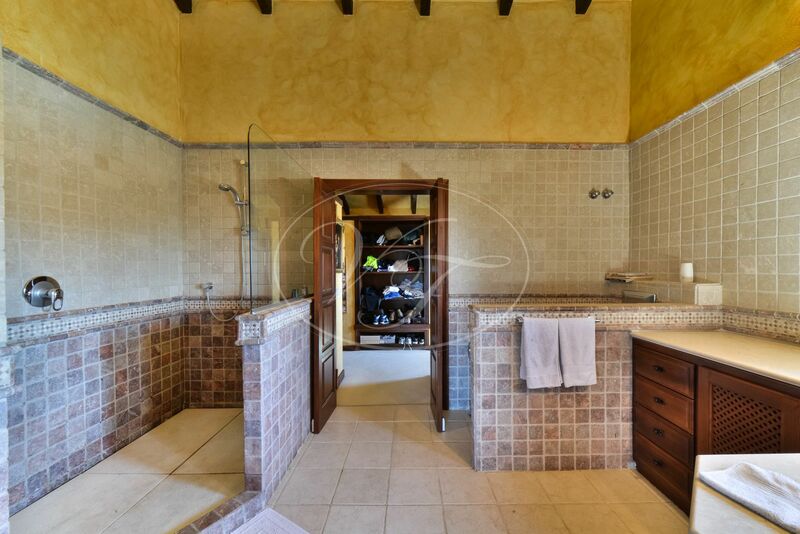 Connected to the main house yet with a separate entrance you will find a 1 bed, 1 bath, fully fitted staff apartment. 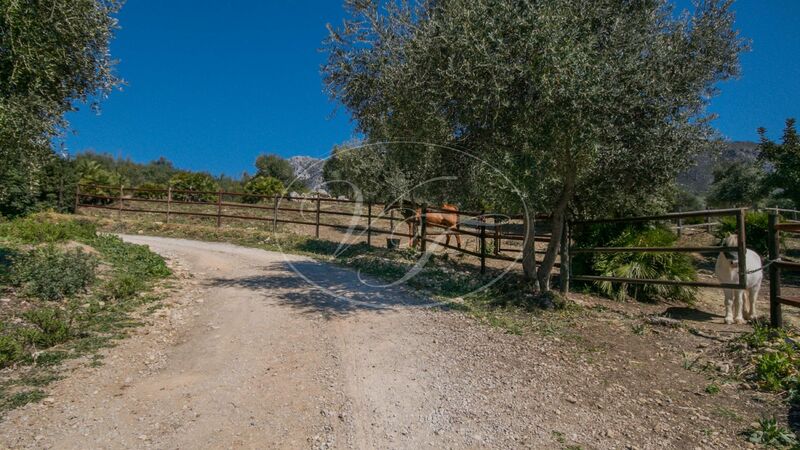 Around the house, you will find a beautifully landscaped garden, with old olive trees, many flowerbeds and a large lawn. The garden is on automatic irrigation. The over 200 m2 beach styled infinity pool has a waterfall feature! From here you have a view either over the valley below you or towards the spectacular mountain drop of the Sierra Crestellina behind you. The area oozes peace and tranquillity, all you can hear is the chirping of birds whilst you are enchanted by the spectacular scenery around you. 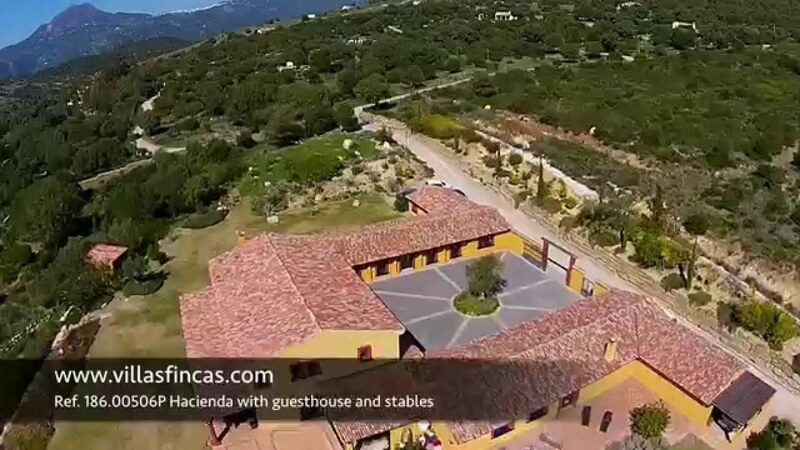 Below the main residence, you will find the equestrian facilities and the staff or guest house. 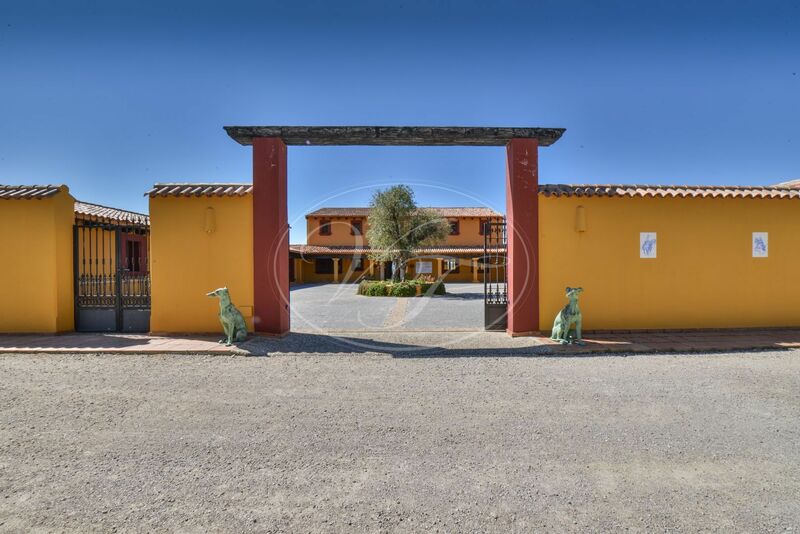 You can drive down to these facilities from the main house but they also come with a separate entrance from the track to not disturb the residents in the Cortijo. 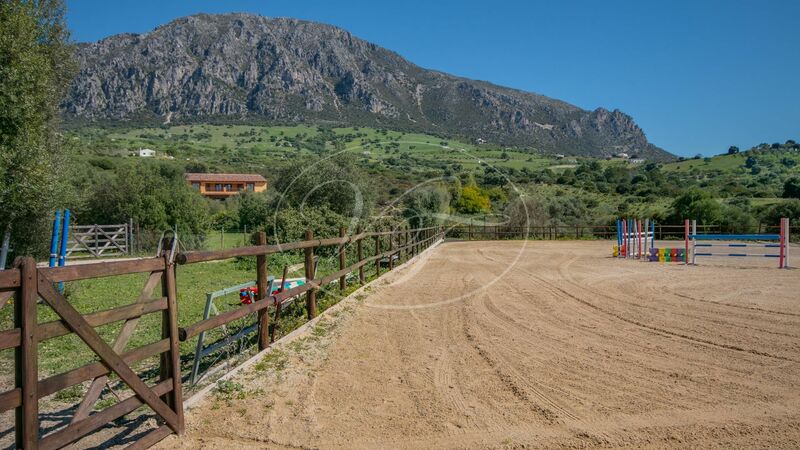 The equestrian facilities come with a professional 25×62m Ottosport Geotextile sand arena, which is on automatic irrigation and has excellent drainage. 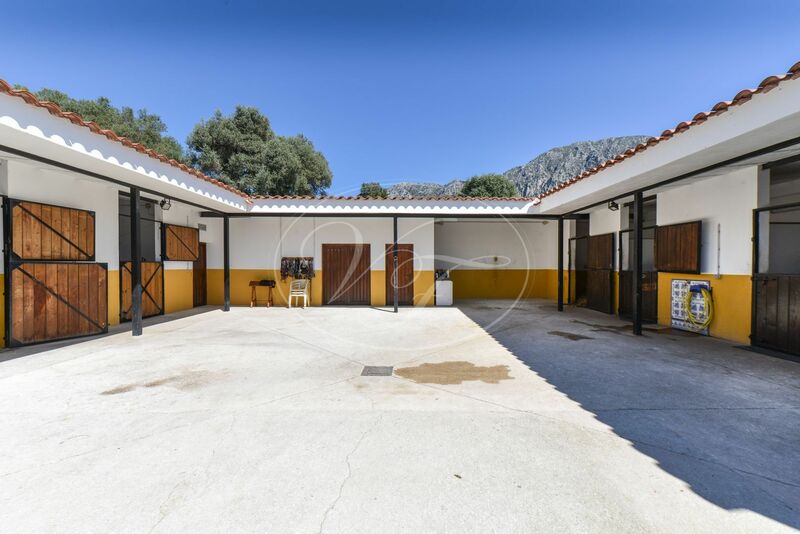 There is a Monarch 4 horse walker with rubber matting and an Andalusian Cortijo styled stable block with a courtyard which offers 7 ample boxes (one of 12,25 m2, four of 10,5 m2 and one pony box of 8,75 m2), a tack room and a feed room. 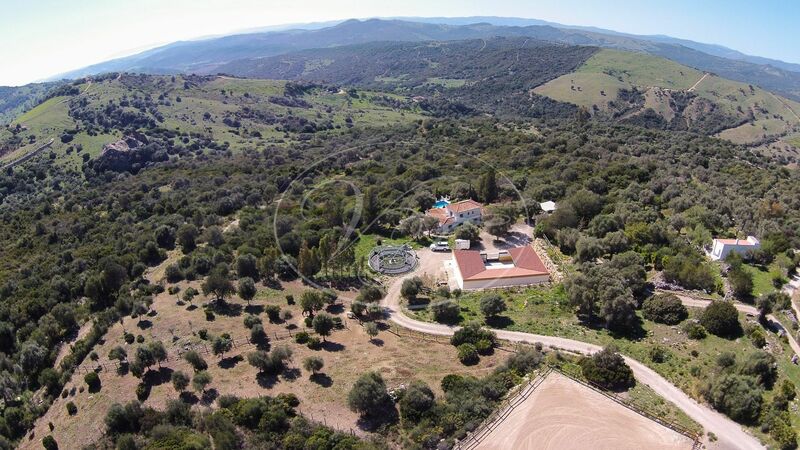 Furthermore, it comes with a 2-horse shower area, WC and laundry facilities, dry hay storage for 70 bales and a covered storage area for 200 bales of shavings. 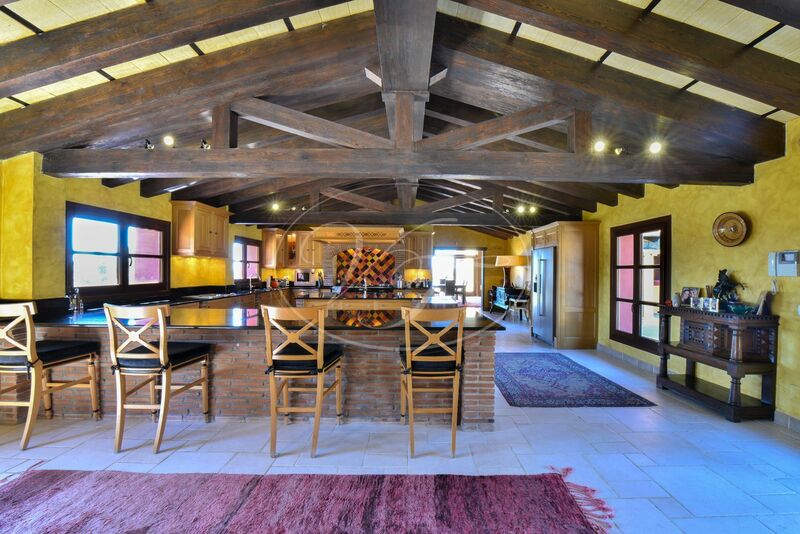 The guest/staff house is divided into two individual units. A large covered terrace gives access to both units. On one side a two bedroom and two bathroom house, with lounge and kitchen and on the other side a fully fitted 2 bedroom, 1 bathroom apartment with kitchenette. Heating through wood burner stoves. 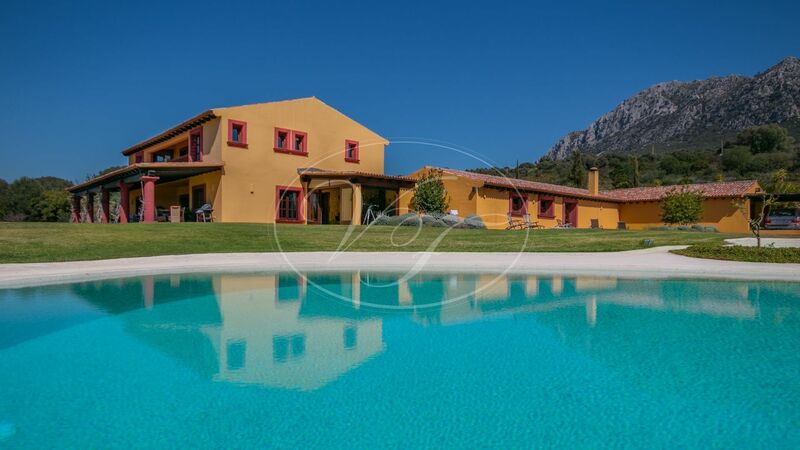 This property has it’s own private garden area and pool. Seldom do you come across an estate that is so well organised! The property is connected to mains water and has a pump system to guarantee the correct water pressure. It also comes with 3 underground water tanks to guarantee the water supply. 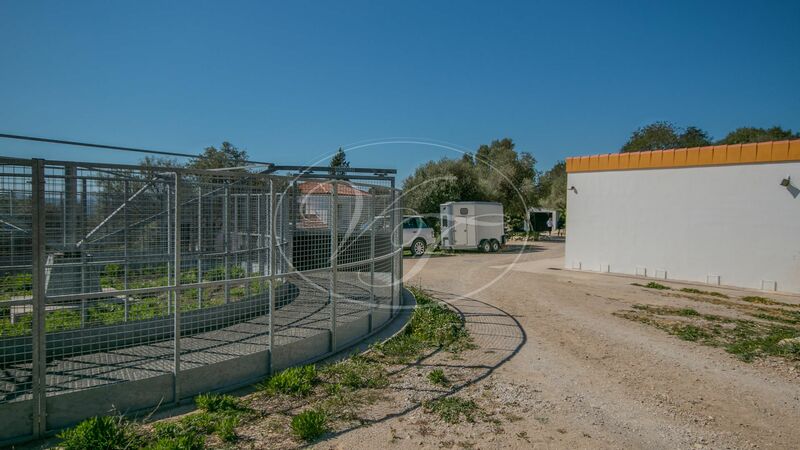 The houses are connected to mains electricity and have a large generator plus a UPS system which is completely automated to guarantee a stable and uninterrupted power supply. 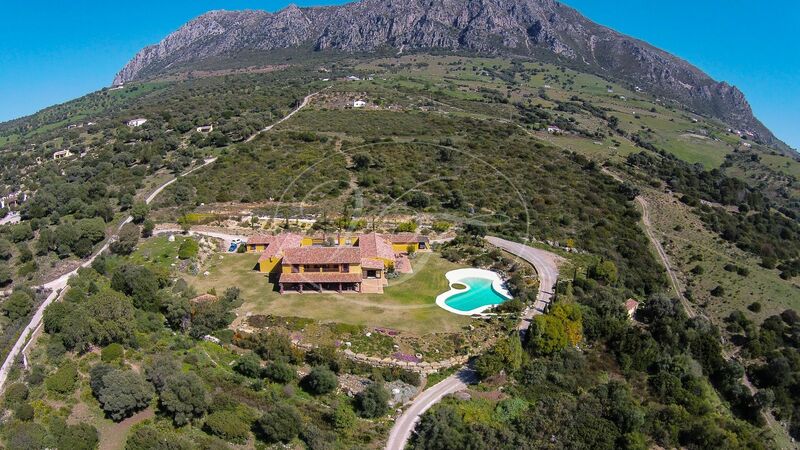 Conveniently located at a 10-minute drive to the toll road access, 20 minutes from Sotogrande and Marbella, 10 minutes from the village Casares, 15 minutes from the beach and the golf courses. 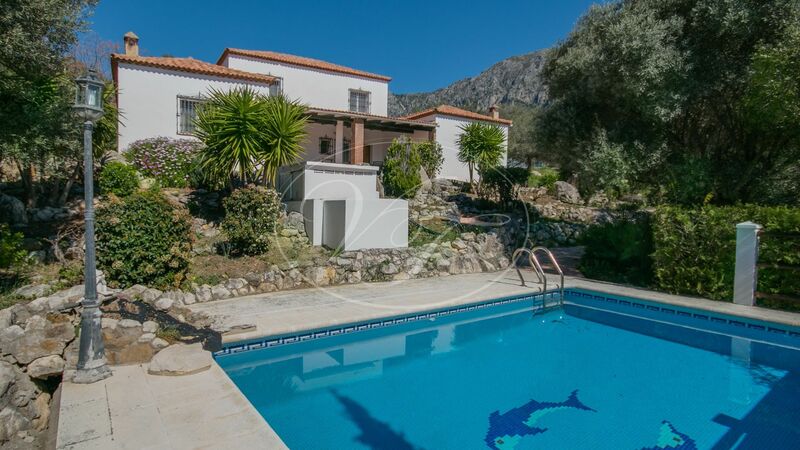 1hour from Málaga airport and approximately 30 minutes from Gibraltar airport. 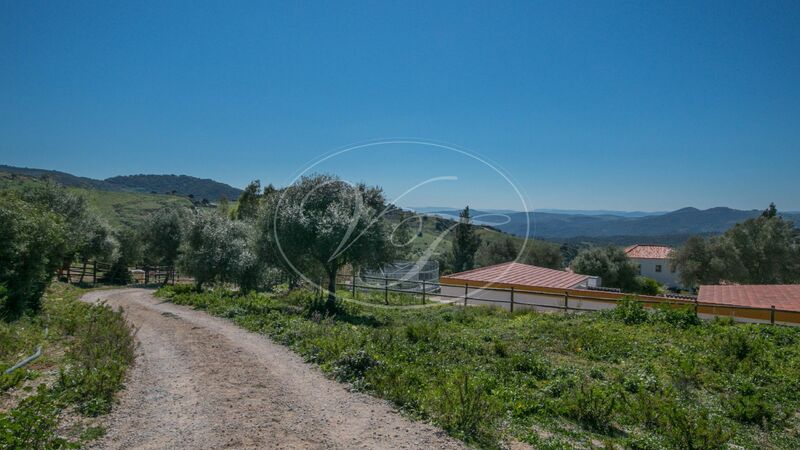 Please, send more information about ref 186-00506P, Cortijo in Casares or similar properties.